BRAND NEW SIZE and STYLE!! 18" BARN QUILTS!! 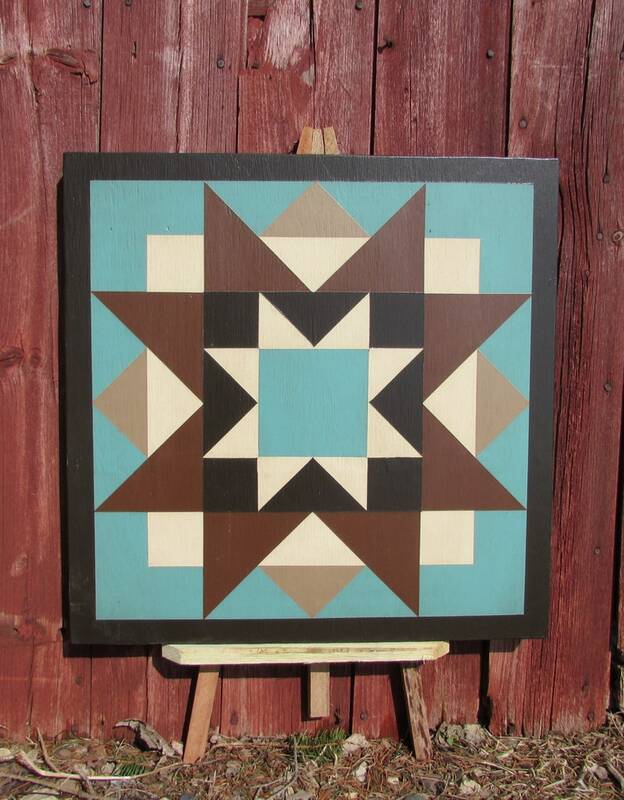 This the listing for the 18" UNFRAMED Barn Quilt - Early Riser! This smaller size will look awesome mounted on a stake out in a garden or flower bed! These "garden" quilts are hand-painted on 3/4" plywood using 3 coats of premium exterior paints with primer, stained for that "antiqued" look, then finished with 2 coats of Exterior Water-based Urethane for outdoor use. The backs are painted in the same "base color" followed by Urethane as well. These quilts are unframed. This pattern is called Early Riser and is called the Aqua and Brown Version. Other color versions are available by special request as well as framed versions and larger versions. Please note that unless otherwise noted, all of my quilts are on a "made to order" basis and could take 3-6 weeks for delivery.